Another fine sunny day after the overnight frost, but a bitterly cold east wind blowing - just the ticket for our archaeological fieldwork at the Cave of the Speckled Horses, near Fiskavaig on the island of Skye. 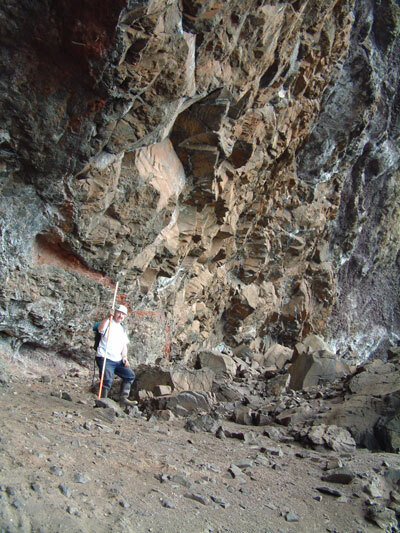 The image below shows George Kozikowski arriving at the site from the south, descending the huge talus in front of the rock shelter. After arrival, we finished excavating the last of the grid squares and cleaned the surface of the exposed archaeological deposits for photographic recording and planning using a drawing frame. The image below shows Trench 1 from the north. 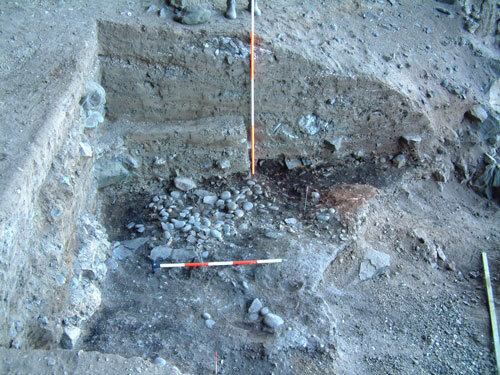 The hearth setting that was located at the far end of the trench has now been removed, while the large dump of fire-cracked pebbles can be clearly seen (Scale=1m and 2m). The orange dump of ash can also be seen at the right-hand side of the trench. More animal bone was recovered from these deposits, while Martin recovered a sherd of pottery with an everted rim. The image below shows the northern end of the trench and also shows the pebbles well in plan (Scale=1m). After recording, we then pushed on with the excavation of the next layers of archaeology in Trench 1. 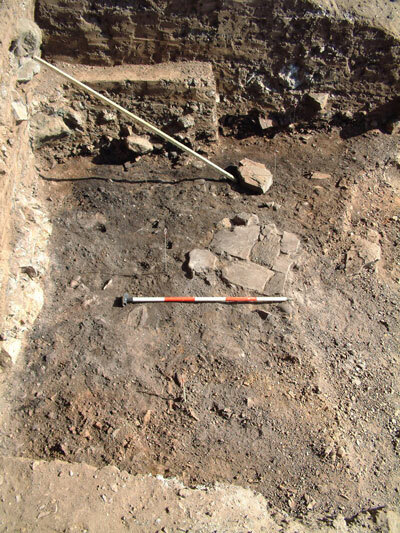 The next layer to be removed was a thin layer of grey to white-coloured wood ash and the deposits of fire-cracked pebbles (shown in the images above). During this process we continued to recover significant quantities of well-preserved animal bone including cow, pig and sheep/goat; some shellfish remains and fish bone; and some good sized lumps of wood charcoal. 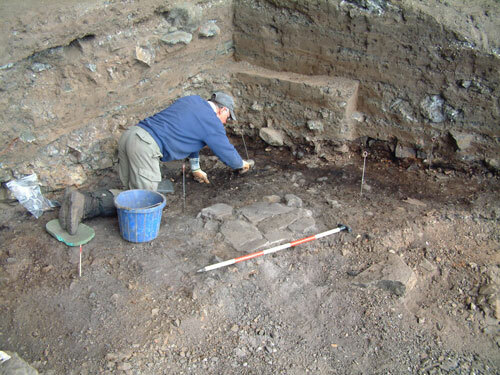 During the removal of this deposit, a second slab-built hearth setting was uncovered (the front edge having been lost to the erosion caused by the sea), close to where the first hearth was found. 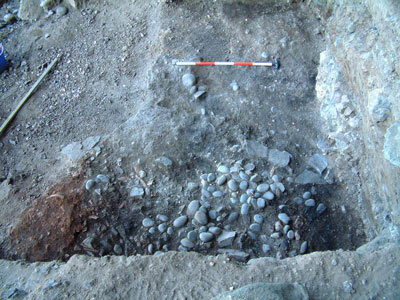 The excavations in this area proved that the large dump of fire-cracked pebbles and the deposits of wood ash and charcoal, were associated with this feature - the earliest feature and deposits identified in this part of the site. Below the layers of fire-cracked pebbles and ash we uncovered a compacted layer of charcoal-rich material, along with the odd fire-cracked stone. The image below shows another view of the hearth setting and the associated deposits, taken from the north (Scale=1m). 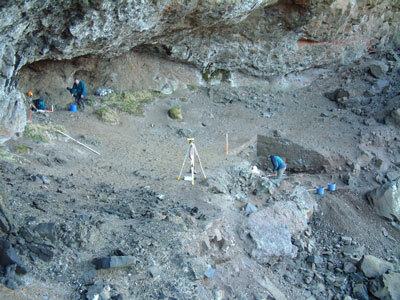 The charcoal-rich areas contained further deposits of animal bone, fish bone and some shellfish, but there were few small finds here. However, organic preservation was extremely good in this layer, which also included degraded vegetable matter and tree bark. 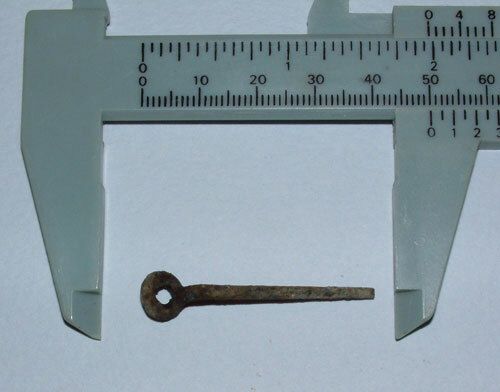 In the north end of the trench George uncovered another couple of nice finds including this small ring-headed pin manufactured from bronze (see image below). 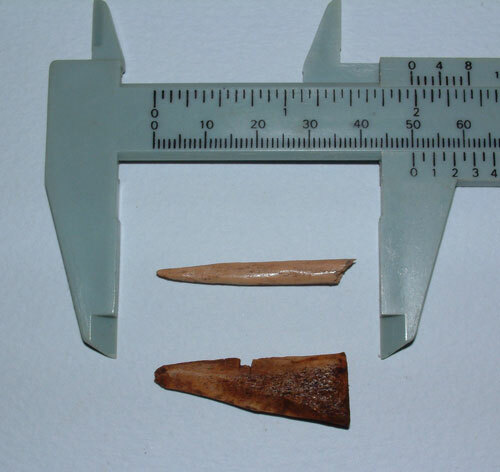 George also recovered the point from a bone needle in the same grid square (see image below), while Steven found a piece of worked bone at the south end of the trench. The latter item, for which we don’t have a potential function at the moment, also has a small notch on one side (see image below). By the end of the working day we had finished removing the ash and fire-cracked stone deposits from the trench and tomorrow we will excavate the remaining archaeological material, including hearth setting F02. The excavation of Trench 1 has certainly provided some interesting results and a wide range of small finds. Hopefully, the last day on site this week will provide a fitting end to what has been a very rewarding dig. 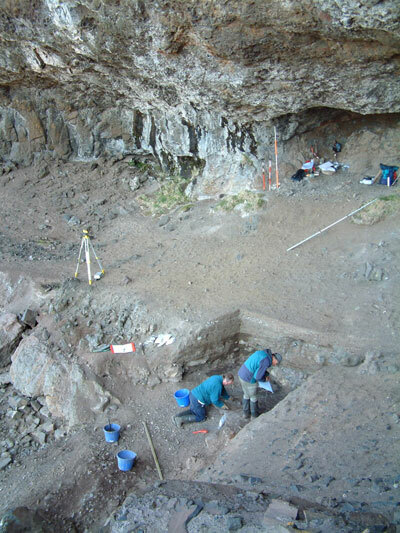 However, we still have many questions to answer about this important site, including the question of function, especially with regards to the dramatic, exposed and remote location in the Iron Age landscapes of Skye. The rock shelter certainly had a commanding view over the adjacent seaways, with the Western Isles clearly visible on the horizon. 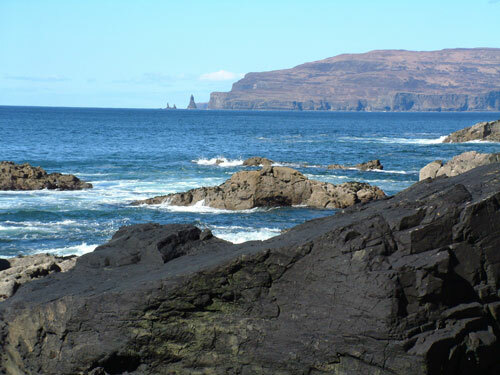 The image below shows the view to MacLeods Maidens on Skye. 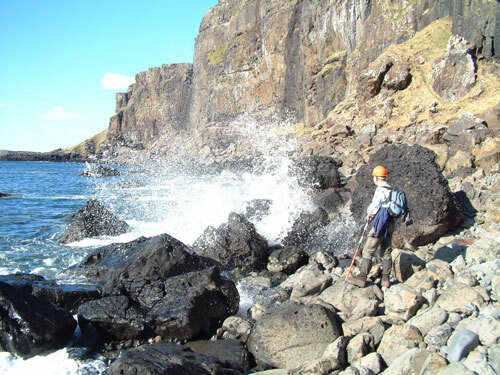 Given the desired sea conditions (reasonably calm), a boat would have provided the ideal mode of access to the Cave of the Speckled Horses - a site that lived up to it’s name today, with some large rollers crashing onto the foreshore and giving Martin a damping down on the walk out along the shore!